Announcing the safe, simple, inexpensive solution that ends anxiety, stress, and sleep disorders… even pain—right from your television set. Nearly 3 hours of a breakthrough combination of light, color, and sound that you will cherish for the rest of your life. Announcing the safe, simple, inexpensive solution that ends anxiety, stress, and sleep disorders… even pain—right from your television set. Nearly 3 hours of a breakthrough combination of light, color, and sound that you will cherish for the rest of your life. 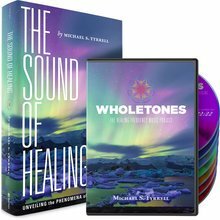 This DVD/BluRay combo pack contains the 7 original songs of Wholetones: The Healing Frequency Music Project set to beautiful, high-definition images and colors for a true chromotherapy experience. Chromotherapy can cost $125 or more for just an hour of therapy! But you can have a similar experience in the comfort of your very own home for one low price… and enjoy it anytime you wish—no extra charge! Option to Play One Video or "Repeat All"
All Covered By 365-Day Money Back Guarantee!